Doneil Jor-Dee Ashley Henry (born April 20, 1993) is a Canadian international soccer player who plays for Vancouver Whitecaps FC and the Canadian national team. Henry began his professional career with Toronto FC in 2010, before going to Europe in 2014 where he played for Apollon Limassol, West Ham United, Blackburn Rovers and AC Horsens. After a series of injury problems Henry returned to Canada in 2017, signing with Vancouver Whitecaps FC and spending a month on loan with the Ottawa Fury. He has also previously represented Canada at the under-20 and under-23 levels. Henry's parents, Beverly and Menocal Henry, moved to Canada from Jamaica. He started playing soccer when he was ten and played youth soccer with the Brampton Youth Soccer Club and North Mississauga. Henry joined the Toronto FC Academy in November 2008, and captained the team through two seasons in the Canadian Soccer League in 2009 and 2010. He appeared for Toronto FC in the 2010 Nutrilite Canadian Championship against the Vancouver Whitecaps and a 2010–11 CONCACAF Champions League Qualifying match against Motagua. He also made his MLS debut and played in another 2010–11 CONCACAF Champions League Match against Árabe Unido during the 2010 season. He also played in an international friendly against Bolton Wanderers. He signed with Toronto FC on August 26, 2010 becoming the first TFC Academy player to sign for the first team. On June 15, 2011, in a 0–0 away draw against New England Revolution, Henry drew high praise from Taylor Twellman who was commentating on the game. After coming on for Richard Eckersley in the second half against Real Salt Lake on April 28, 2012, he scored his first goal for Toronto in the 77th minute in a 3–2 away defeat. On August 21, the club announced that it had re-signed him to a long term deal. During the 2011–12 CONCACAF Champions League, he made four appearances during the 2011 season and an appearance during the 2012 season. He also made two appearances in the 2012–13 CONCACAF Champions League during the 2012 season. Henry scored his second goal for Toronto outside the penalty box in a 2–0 home victory over rival Montreal Impact in the Canadian Championship on April 24, 2013. Prior to the 2014 season he spent some time training with Premier League side West Ham United. After scoring mid-week in the Canadian Championship against Montreal Impact he scored the 92nd minute game winner against Columbus Crew in a 3–2 home victory May 31, 2014. In October 2014, it was officially announced that Henry had been sold to 2014–15 UEFA Europa League and Cypriot First Division participants Apollon Limassol, for an undisclosed fee in April 2014 prior to the commencement of the 2014 MLS season. Representatives from Toronto FC confirmed that the deal has a sell on clause and that they intended to enter into talks with Henry and Apollon Limassol with the hope of keeping the player on loan again for the 2015 MLS season. Having previously had two training stints with West Ham in the Premier League after the player was recommended to manager Sam Allardyce by Ryan Nelsen, Henry signed for the club on January 3, 2015 on a "long term" contract for an undisclosed fee. He made his West Ham debut on August 6, 2015 in a 2–1 away defeat to Romanian side FC Astra in the Europa League qualifying stages. His team was eliminated as a result of the defeat. This was his only appearance and he left the club in December 2017 when his contract was cancelled by mutual consent. On March 4, Henry was loaned by West Ham to Blackburn Rovers in the Football League Championship, on a one-month loan. He made his debut on the same day against Sheffield Wednesday, a 2–1 win for Rovers, a performance described by Rovers' manager, Gary Bowyer as "magnificent". In his second match for Blackburn on March 11, he got an assist in a 94th-minute goal from Jordan Rhodes to give them a 1–0 victory over Bolton Wanderers. In his third game for Blackburn, a 3–1 away win against Charlton Athletic, he sustained a hamstring injury which manager Bowyer said would mean the end of the season for Henry. With his loan cut short, he returned to West Ham United. He returned to Blackburn on loan on November 24, 2015. On August 31, 2016, Henry was loaned by West Ham to Danish Superliga club AC Horsens for half a season. On October 23 Henry started his first game in the starting line-up, against Randers FC. The game resulted in a clean sheet and 1-0 victory for Horsens and Henry. In Henry's second start with Horsens, he suffered an ACL tear, which would end his season. He went back to West Ham in start of January 2017. On December 22, 2017, Henry was signed by Vancouver Whitecaps FC. On April 25, 2018 Henry was loaned to United Soccer League club Ottawa Fury until the end of May. According to Vancouver Whitecaps FC head coach Carl Robinson, the goal of the loan was to help Henry reach full fitness by getting competitive match time. Henry made three appearances for Ottawa, all of which were clean sheets, but was forced to sit out the last two games of his loan, one due to bronchitis and one due to fatigue. On May 29, he was reported to have returned to Vancouver. Henry would make his Whitecaps debut in June 2018, shortly after returning from Ottawa Fury on loan. He scored his first league goal for Vancouver against Minnesota United in Vancouver's 2019 MLS season opener on March 2. Henry played three matches for the Canada U-20 men's national soccer team. He was selected for the Canada U23 roster to partake in the 2012 CONCACAF Men's Olympic Qualifying Tournament. After sitting out the first game he started and scored the opening goal against the United States U23, the match ended in a 2–0 victory for Canada. Henry earned his first cap for Canada's senior team August 15, 2012 in a friendly against Trinidad and Tobago. He started the match before being subbed out at halftime for Pedro Pacheco, the game ended in a 2–0 victory. On December 10, 2012 he was awarded the 2012 Canadian U-20 Player of the Year, receiving 37.8% of the vote and just beating out Samuel Piette for the award. On June 27, 2013 Henry was listed as a part of the confirmed 23-man squad for Colin Miller's Canada squad for 2013 CONCACAF Gold Cup. ^ a b c Appearances in the CONCACAF Champions League. ^ "04 February 2015 Premier League Clubs submit Squad Lists" (PDF). Premier League. p. 33. Archived from the original (PDF) on February 9, 2015. Retrieved March 7, 2015. ^ "Doneil Henry". National Football Teams. Benjamin Strack-Zimmerman. Retrieved January 4, 2015. ^ "Henry Embodies The Spirit Of Toronto". www.torontofc.ca. Retrieved December 22, 2014. ^ "Henry embarks on new journey in Europe". www.torontofc.ca. Retrieved January 4, 2015. ^ "Meet The Select Seven". Toronto FC. Retrieved December 22, 2014. ^ "Doneil Henry | Canadian Championship 2010". World Football. Retrieved November 23, 2018. ^ a b c d "First Academy Player To Sign Pro Contract". Toronto FC. Retrieved December 22, 2014. ^ a b c d e f "Doneil Henry » Club matches". World Football. Retrieved November 23, 2018. ^ a b "Doneil Henry » CONCACAF Champions League 2010/2011". World Football. Retrieved November 23, 2018. ^ "Henry Making Strides". Toronto FC. June 16, 2011. Retrieved June 16, 2011. ^ "Reds Suffer Salt Lake Heartbreak". Toronto FC. April 28, 2012. Retrieved April 29, 2012. ^ "Doneil Henry Here To Stay". Toronto FC. August 21, 2012. Retrieved August 21, 2012. ^ a b c "Doneil Henry » CONCACAF Champions League 2011/2012". World Football. Retrieved November 23, 2018. ^ a b "Doneil Henry » CONCACAF Champions League 2012/2013". World Football. Retrieved November 23, 2018. ^ "Reds blank Impact in first leg of ACC". Toronto FC. April 24, 2013. Retrieved April 26, 2013. ^ "TFC's Doneil Henry enters 2014 MLS season with confidence". Toronto Star. March 13, 2014. Retrieved April 10, 2014. ^ "Henry Scores Last-Gasp Winner as Reds Lift Trillium Cup". Toronto FC. May 31, 2014. Retrieved June 1, 2014. ^ "Toronto FC sells Doneil Henry to European club but hopes to keep him". The Globe and Mail. Retrieved December 22, 2014. ^ "Henry sold to Apollon Limassol". Toronto FC. Retrieved December 22, 2014. ^ "Toronto FC sold Henry to Apollon Limassol". Sportsnet.ca. Retrieved December 22, 2014. ^ a b c "Hammers sign Henry". www.whufc.com. Archived from the original on January 3, 2015. Retrieved January 3, 2015. 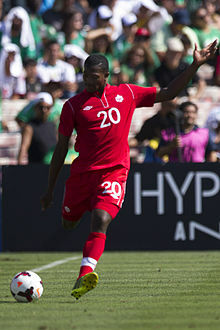 ^ "West Ham sign Canada defender Doneil Henry on long-term deal". BBC Sports. Retrieved January 5, 2015. ^ "Astra Giurgiu 2-1 West Ham". BBC Sport. August 6, 2015. Retrieved November 24, 2015. ^ "Defender Doneil Henry departs - West Ham United". www.whufc.com. Retrieved December 22, 2017. ^ "West Ham: Blackburn Rovers secure Doneil Henry loan". March 4, 2015. ^ "Sheffield Wednesday 1-2 Blackburn Rovers". BBC. Retrieved March 4, 2015. ^ "Rovers manager Gary Bowyer was full of praise for the way Doneil Henry took his first outing in English football in his stride in the win over Sheffield Wednesday". www.rovers.co.uk. Retrieved March 5, 2015. ^ "Blackburn Rovers 1-0 Bolton Wanderers". BBC Sport. Retrieved March 12, 2015. ^ "Doneil Henry's loan spell with Blackburn Rovers has been cut short due to injury". www.rovers.co.uk. Retrieved March 18, 2015. ^ "Doneil returns to Rovers!". November 24, 2015. ^ "AC Horsens lejer midtstopper i West Ham United". AC Horsens. Retrieved August 31, 2016. ^ Matt Harris"date=November 2, 2016. "West Ham defender Henry out for season after injuring knee with AC Horsens". Essex Live. ^ Dan Coombs (November 2, 2016). "West Ham loanee Doneil Henry tears ACL, manager upset". HITC sport. ^ bold.dk. "Bo H. bekræfter mulig stoppertilgang". bold.dk. Retrieved December 22, 2017. ^ "Whitecaps FC acquire Canadian international centre back Doneil Henry". Vancouver Whitecaps FC. December 22, 2017. Retrieved December 22, 2017. ^ a b "Canadian International Doneil Henry joins Fury FC". Ottawa Fury FC. Retrieved April 25, 2018. ^ a b J.J. Adams (May 29, 2018). "Whitecaps look for Rapid improvement after maddening month of miscues". The Province. Retrieved May 31, 2018. ^ Brandon Timko (June 2, 2018). ""It's been a long time coming": Henry sharp in his first appearance". Vancouver Whitecaps FC. ^ Dailey, Mark (March 2, 2019). "9 players make Whitecaps debut in MLS season opener". ^ "Canada m23 announces pre-tournament roster — Canada Soccer". Retrieved December 22, 2014. ^ Canadian Press (August 15, 2012). "Ricketts leads Canada to 2–0 Win over T&T". Rogers Sportsnet. Toronto. Retrieved August 15, 2012. ^ "Henry, D'Angelo named 2012 Canadian u 20 Players of the Year". Canada Soccer Association. Retrieved December 10, 2012. ^ a b c d e f g h i j Doneil Henry at Soccerway. Retrieved January 4, 2015. ^ "Henry, D'Angelo named 2012 Canadian U-20 Players of the Year". www.canadasoccer.com. December 10, 2012. Retrieved December 22, 2014. ^ "Canada Soccer". canadasoccer.com. Retrieved December 22, 2017.